TSH Newsroom: Making your website a better salesman..
Making your website a better salesman..
By helping your customers quickly find what they are looking for, you will likely sell more. To accomplish this, look at your site’s navigation as well as its search function. In the B2B world there are more unique challenges and requirements. By using a Website designed for B2B commerce and letting your data analytics tools build your website deals, suggestions and more, you can turn your website into your best salesman. An optimized site search is crucial for B2C and B2B websites. But B2B sites often have unique challenges when it comes to search. Here are some of the most common. 1. Part number searches. In B2B, shoppers search by the part number they use to refer to an item. In some cases, they may search by a partial part number, or the part number may have a hyphen in it. Moreover, there can be more than one part number for the same product. Part numbers can be problematic for standard search platforms. NDC codes for example in the pharma world are sometime 10 sometime 11 and sometimes people enter the "-" and some others do not. 2. Similar products. Many B2B companies have multiple products that are very similar. They are represented by the same photo and, perhaps, nearly the same description. There may be 100 SKUs that look the same but are different in size, strength, and other attributes. This can make it difficult for shoppers to locate the correct item in a search. 3. No pricing or add-to-cart on search results. B2B companies often provide customized pricing by customer. Thus, a company may not list prices in search results and may exclude an add-to-cart button in the results. This slows down purchases. 4.Inventory and Stock Information. B2B companies often provide real time inventory and while it may hurt a company to say you are out of stock on an item on the sales side. It allows them to offer other similar items or replacement and or substitutes rather than take the order and have to let a customer know you cannot ship the item. Providing that information can save time effort and increase sales if done properly. Here are a few ways to get the most out of your site search. 1. Promoting specific products for top searches. Promote Trending items , best sellers and hot sellers on each search result, Highlight the product class of items your customers search on and link to specials using an image and description. While your system can automatically recommend items also make you can manually override the search results if necessary. Many sites and tools offer only one or the other. With the changing products you need flexibility in your software. 2. Improve your search-results page with a focus on selling that item. compare your search results pages to large retailers like Amazon and Office Depot. Improve your product images. provide customer specific pricing in multiple units of measure and an add-to-cart button. Include links to additional product information. leverage your manufacturers and buying groups for more detailed data. In the MedSurg Space both NDC and IMCO offer images and descriptions that can easily be imported to create your online catalog. and in the Pharma Space both the FDA and Medispan offer product information , Medispan also offer product images and descriptions such as imprint , color and shape. 3. Ensure part numbers return the correct results. Add Competitors items numbers as aliases for your products, add manufacturers item numbers and add commonly used keywords for items. 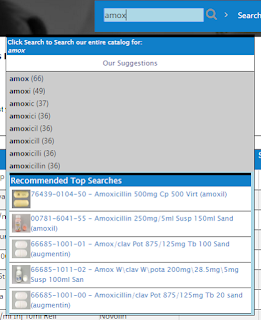 IE add Tylenol when looking for acetaminophen. B2B ecommerce shoppers often search on part numbers. Test part numbers and partial numbers based on what you see people searching for on your site and tweak if need. 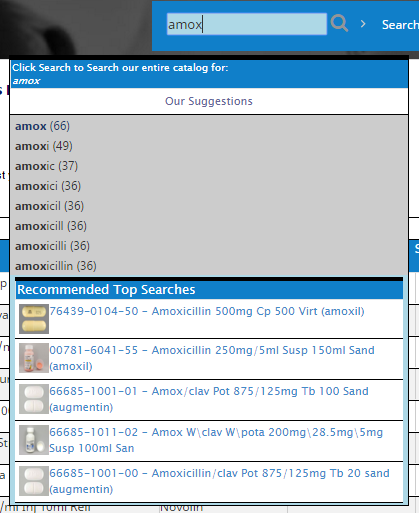 Add realtime alerts for specific keywords or part numbers so if you are short supply or want to contact customers searching for a term - offer that capability in real-time and hop on a chat to help them find what they need. Example facet search typically on the left includes "Categories," "Brand," and "Price. ", or Manufacturer. Having good faceted search requires data for all of the attributes to filter on. This often entails a review of product data and a solution to more easily maintain data, such as integrating with product information from a third party, like NDC, IMCO or Medispan and the FDA. Example "gloves" at your site would activates automatic suggestions for the top five best selling gloves and offer how many items in your database match the search as they type in letters. 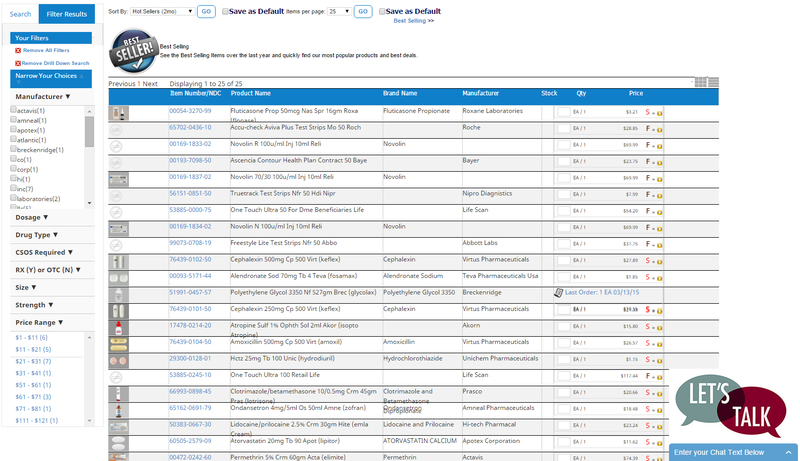 Identify misspellings and direct users to intended products. Typos are common, especially when users are on smart phones. Identify misspellings in search terms, and then quickly direct users to what they are looking for. for example from OfficeDepot.com, "lsr paper" was corrected, to display "laser paper," the correct spelling. 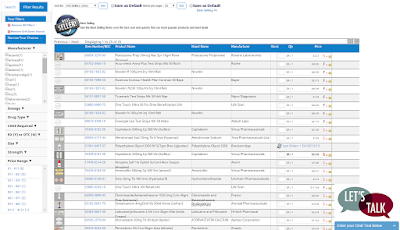 Create a library of aliases or synonyms and common misspellings and add to your database.. The more your search the better suggestions and other results will be as a good search engine has built in learning capabilities so it can automatically suggest information and better items. work with your vendor to tweak and create new categories automatically such as overstock items , where you have more then 3 months supply on hand inventory, or closeout items where you have had it on your shelves for over 180 days. Don’t let all of the possible improvements overwhelm you. Start by working with a vendor that has all these tools available and built in. Look at how common site searches are performing, and decide which new features will generate the best return. Implement those features and measure the impact. Continuous improvement is the name of the game and working with a software vendor that is constant adding features and functions to your search engine to help you keep up.